Having failed to enter it last year, I was determined to make ice cream cupcakes for this year's Ice cream cupcake round up hosted by Cupcake Project and Scoopalicious. A friend had me over for Mexican food night, so I thought I'd make Mexican themed ice cream cupcakes. I went with Cupcake Project's recipe for Tres Leches cupcakes. Tres Leches means 3 milks, the milks being coconut, evaporated and sweetened condensed. For the ice cream part, I went with pineapple sherbet. Yeah, the very stuff floating in baby shower punches everywhere. And for an additional touch of deliciousness I made some dulce de leche! This was my first time ever making it, though I've wanted to try it for years. I was scared because, you see, you simmer the whole can in water for 3-4 hours, and there are lots of stories out there about exploding cans of hot caramel. No explosions this time, thankfully. I made sure the can was fully covered with water the whole time. It turned out awesome! Thick, sweet, creamy. Unfortunately the can was still molten lava hot when I needed to take the photos, so the caramel topping you see is a melted caramel I dug out of my purse. So I made my cupcakes, packed everything up and headed over to Mexican night. When it was time for dessert, I dished out the cupcakes, sherbet and dulce de leche for everybody. They got the deconstructed version. We all sat down to dig in, and my friend, who has no pets, said "why does it all of the sudden smell like dog in here?" Ummmm.... turns out it was the tres leche cupcakes. Somehow the combo of the 3 milks had resulted in a slight wet dog smell. Yup. I had made and served wet dog cupcakes. They did not taste like wet dog (not that I have tasted wet dog, but I imagine wet dog does not taste sweet and milky and coconutty). 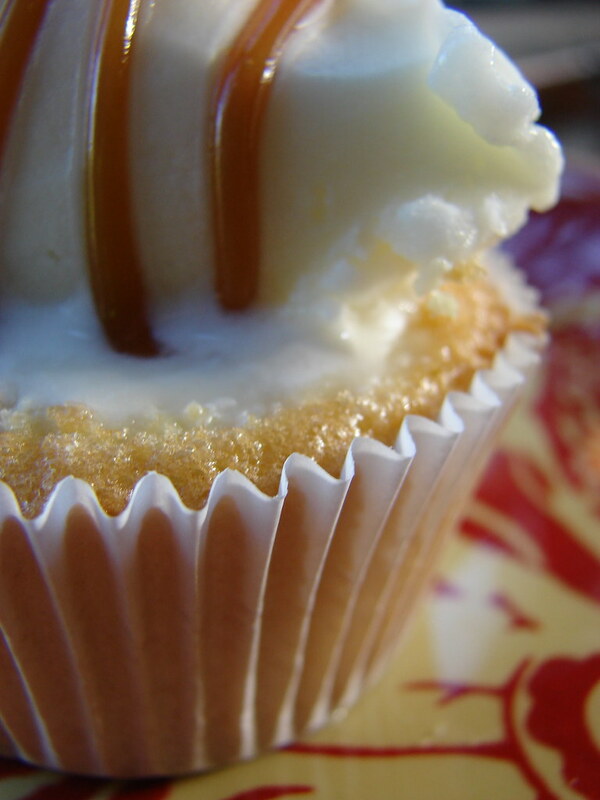 Overall, the pairing was a success, the sweet fruity sherbet with the milky cupcakes and the creamy caramel. It's a shame they had to smell like wet dog. Anyway, I really enjoyed reading your blogs and I find it very useful. Please keep on sharing and looking forward for more of your updates. Thanks. i love the name.. "wet dog cupcakes" very unique.. I LOVE that your cupcakes have a story behind them! the fact that you called them wet dog is all the better!! I think they look great... maybe I'll try them during allergy season when everyone's noses are stuffed up! nice job! these look great! so funny about the wet dog, so I love the name! sound fantastic despite the smell!